I‘m Lukasz Fikus, born in Warszawa, Poland in 1965. I graduated from Warsaw Polytechnic University - Electrical Engineering; speciality power distribution, and a major in High Voltage Physics. I also have an Executive MBA diploma from WUT School of Business in Warsaw in cooperation with London School of Business. I started doing audio projects as a hobby in the eighties and since then my adventure in this world has expanded. Please read my blog page Lampizator.eu for anecdotes and blow by blow accounts of my evolution! In March 2010, after 19 years of working for one giant multi-international engineering company, I decided to quit and never ever again work in a corporate environment, sitting behind a desk from 9 to 5, unable to tap into my creative mind in any real way. I stepped down from the position of Poland General Manager. I liberated myself. I registered my own company in July 2010 and maintain a manufacturing workshop in Warszawa, Poland, with six employees and six subcontractors. This workshop is already serving customers across all continents! I do not want to betray my “Lampizator principle” which champions the individual, honest business and customer concerns. I want to continue researching, writing and following the quest of truth as always. Being a Prometheus and a salesman? Does it stand the test of integrity? I think that the answer is - yes ! 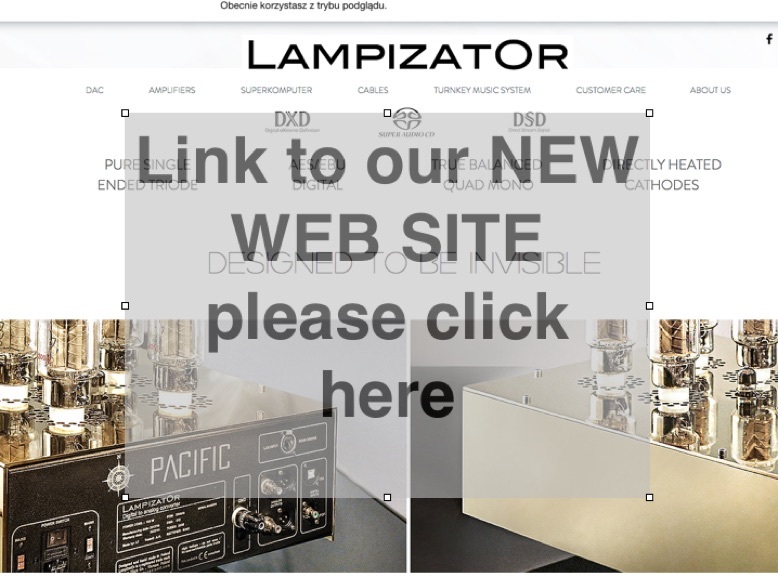 The unique LampizatOr products that we build are the outcome of my passion, experience, engineering skills and some degree of craziness too ! They are also strongly driven by the passion of all my team. We are all audiophiles and passionate about it. Welcome to the Fikus world of audio engineering. I am not trying to compete with the DIY community with my work and products because I believe there are still enough non-soldering music lovers in the world who appreciate and want absolute state of the art products made by hand. Finally I want to thank my Master Guru Evgennyi Kreminski who taught me everything about soviet triodes. We are a modern 21’st century business. It just so happens that by using good old electrical knowledge we manage to beat - with our sound - the commonly found benchmark products. We design the products the good old way - with large transformers, with multiple power supplies, with large chassis, with a lot o point to point connections made with silver wires in teflon. We use hundreds of very good and over specified components from best known vendors and brands and we choose them by ear first. We carry enormous R&D efforts every day every week every weekend too, in order to outperform ourselves and competitors. Every one of our products has to undergo rigorous audiophile testing marathons. If we have to compromise somewhere in our design - we tell you about it and we offer immediately a non-compromise solution at upgraded price. Every product we build carries a serial number and is unique because we build it for you. It is like no other because we first listen to your requirements and we build a machine that will suit you best now and in the long haul. Every component is documented in our log-book of manufacturing for future reference, servicing and upgrading. Every component carries a five years warranty that is unconditional and transferrable. We honor the warranty on every product bought by you second hand. Every product can be upgraded in the future to any specs or level you desire. Any forgotten feature can be added later. After a product comes to our factory for repair or upgrade, we can negotiate “resetting” the warranty to new 3 years. After a thorough factory overhaul our previously owned products get a new life with new serial number, new log-book entry and new warranty. We ship the products mainly by DHL, which is our forwarding partner of choice. That means you get the goods within 48 hours and intact. Our packing is second to none because it is based on the experience gained over several hundreds of shipments we made so far. Finally: What is LAMPIZATOR? It is a play on Polish Lampa (vacuum tube) and Terminator. It is Lukasz Fikus’ nick name that stuck to the product. We are very proud to be a part of one of the most unique business projects in the history of Polish Hi-Fi. We are already more famous worldwide than Diora or Unitra - our Polish electronic giants. Out of passion, hard work and dedication, mixed with some talent and some craziness came a great product and great team to work with. Our vision is to maintain manufacturing in Poland, now part of European Union. We design everything we sell in our lab. Every circuit is first imagined, then drawn, prototyped and created in out lab. We cooperate with over 30 small and medium firms in Warsaw area, Poland. Even if that means sometimes we have to compromise on the looks, on the physical appearance of our products, we still choose to work with friendly local vendors. We do not intend to grow the size of our firm to make it too big to be fun. We don’t want to outsource anything to foreign countries. We want to keep full control on the product and the way it sounds from A to Z. We want to create hi-fi products that stay in your home. Yes, It is that simple. When you try them - you KNOW you want them and then they will stand the test of time. These are not gadgets which get sold after 6 months to make room for another gadget. Our products aspire to be SO MUSICALLY INVOLVING that you simply can’t find anything better. We have certain criteria and certain musical taste. Before our DAC of today was created, we had to take hundreds of decisions over many years. Do we use this transformer or that? Do we use the tube at 5 mA or at 12 mA? Do we use chokes or resistors for smoothing? Do we regulate the digital supply? etc etc. Every decision could have been different but we took decisions to get as close to our ideal sound. Big companies just can’t do this process. They use school book design, ready blocks. This is good to make a refrigerator or a car, but not for high end stereo. The result is a very subjective accumulation of hundreds of decisions that make a distinct product. We like that product. If you like it too - you will agree that our decisions were right. If you don’t like it - it is a plain and simple case of different taste. We don’t believe in one product for everybody so we choose to target the like minded audiophiles. This is our strategy. We want to provide the true music lovers with fabulously musical stereo equipment, that goes beyond what they imagined possible.